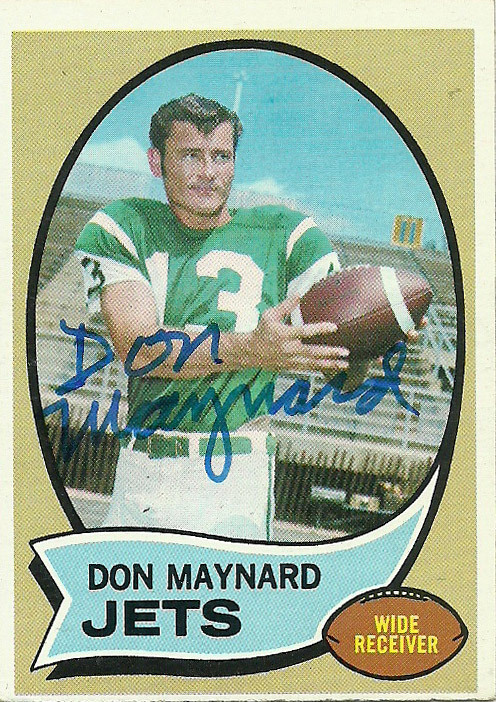 Maynard was originally drafted by the New York Giants in 1957, but only played one lone season for them before bolting North to play for the Hamilton Tiger-Cats of the CFL. He’d return shortly thereafter to the fledgling AFL in 1960- becoming the first signee of the then New York Titans (later Jets). Over the next 10 seasons in the AFL he’d be named to the All-AFL team 4 times. In the final season before the AFL NFL merger, he’d help the Jets win Super Bowl III and notably graced the cover of the big game’s program guide as well. 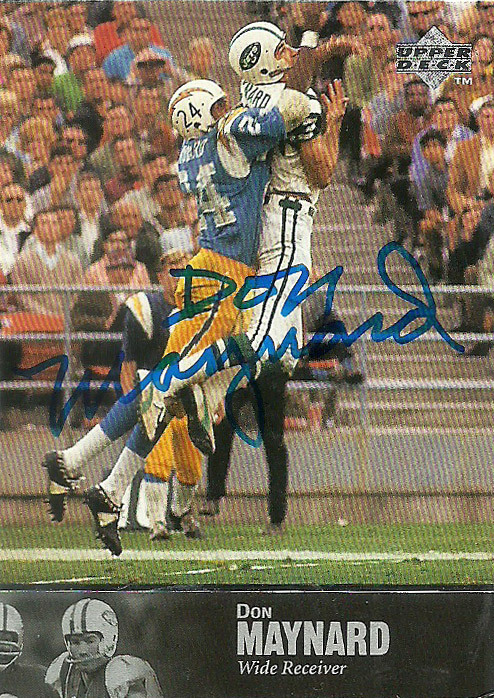 Don joined the Rams in 73, but ultimately ended up on the St. Louis Cardinals for a lone season, retiring after a bout with the WFL playing for the Shreveport Steamer/ Houston Texans. Maynard played college ball for Rice, and later Texas Western (UTEP). He was a proven runningback and defensive back, but was unpolished gold at receiver. His number has been retired by the Jets, got his gold jacket along the way, and has been a Grand Marshall for UTEP at one of their parades. He lives outside of the El Paso area, in relative anonymity. I had been wanting Don for sometime but I thought he was out of reach. I really liked these cards of his and always wanted to get them signed so I went ahead and took a shot with a small donation. In the end I also had a Pro Set Super Bowl III card that I opted to send to Matt Snell instead (because he should’ve been MVP). Still the Topps 1970 is iconic, while the Upper Deck Legends 1997 hits all the marks for perfection.